Rev. 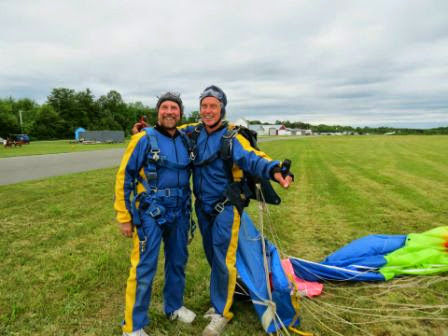 Wesley Oake's feet may be firmly on the ground but his head is still in the clouds following his first parachute jump on Saturday, June 21, 2014 in tandem with David Williamson of Atlantic School of Skydiving in Nova Scotia. He said the first 20 seconds of free-fall were definitely not a thrill but once the parachute opened it was absolutely amazing and so serene. 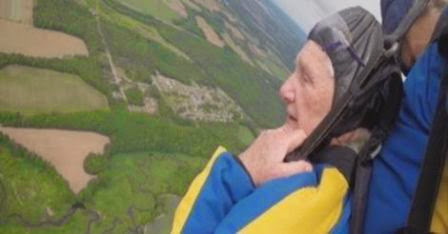 Asked if he would do it again, he says, "Oh yes, I'm ready to jump again and would like to do it when I am 100 years old.". Rev. Oake's courageous feat has brought outstanding recognition for the Gander Heritage Memorial Park. The park has been visited by several media persons and we look forward to future newspaper, television and radio publicity. Congratulations and more donations are coming in daily and although Rev. 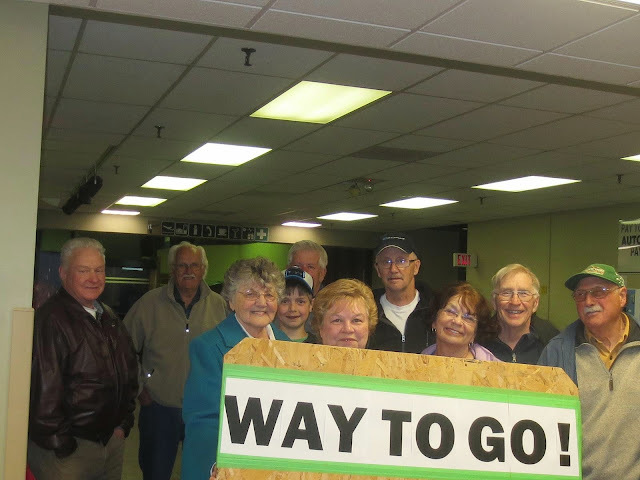 Oake's goal has already been surpassed, he is still determined to continue raising money for the park. We are extremely grateful to him and to all those who have contributed and will contribute on his behalf. We remind our readers that they may donate by cheque or money order to our treasurer as follows: Gander Heritage Memorial Park, c/o Joy Janes, 8 Bachman Place, Gander, NL A1V 1R8. Please indicate your donation is to sponsor Rev. Oake, or if you wish to donate by Credit Card simply follow the donation link on this website and email Joy at: rajanes@nf.sympatico.ca to let her know your donation is on behalf of Rev. Oake. A receipt for Income Tax purposes will be issued by the Town of Gander for all donations made to the Park. Our sincere thanks to CBC reporter Colleen and her cameraman; Gerard; Mary; Rev. 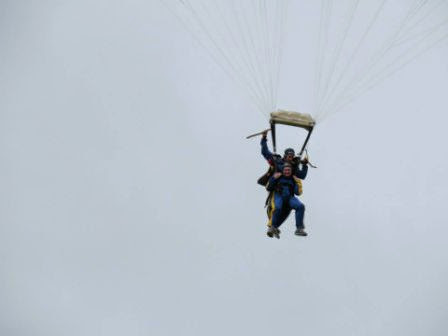 Oake's son Dana; the crew at Atlantic School of Skydiving; and all those who were there to cheer Rev. Oake on. It was a long day for all of you waiting for the sky to clear in Nova Scotia but it was an even longer and tense day for all of us here in Gander waiting for the official news that the jump was over and that Rev. Wes was safely on the ground. It was a huge relief to all! Furthermore, it wasn't until the next day we learned that our Chairman Wilson Hoffe, who accompanied the Reverend to Nova Scotia decided that if Rev. 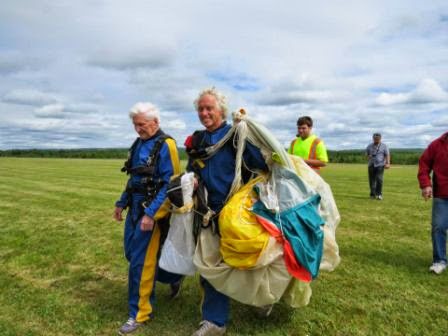 Oake at age 92 could safely parachute then why couldn't he. 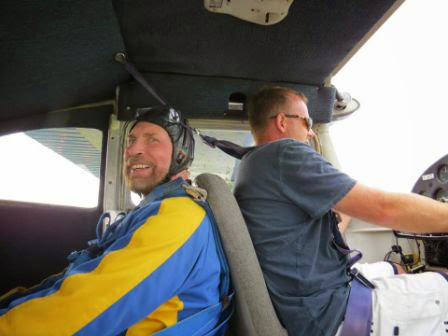 So giving it no more thought, Wilson donned his parachute gear, boarded the Cessna 182 and in tandem with Dave Williamson, jumped from the aircraft and successfully completed his first ever parachute jump as well. We are so pleased for Wilson and have some photos to show how happy and proud he is to have accomplished this 'dare-devil' act. 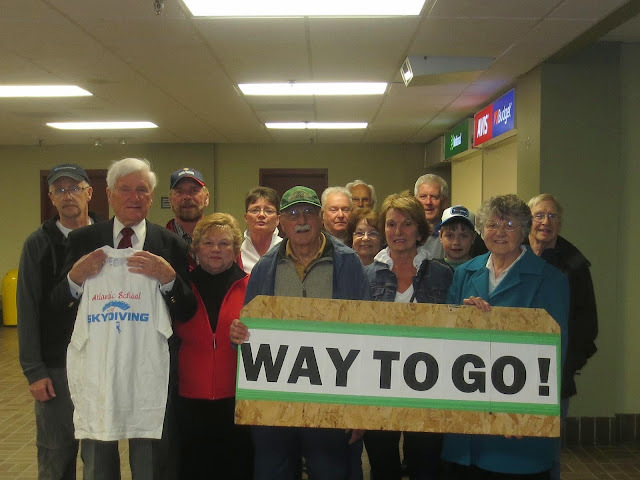 Family, friends and Park Committee were at the Gander Airport to welcome home Rev. 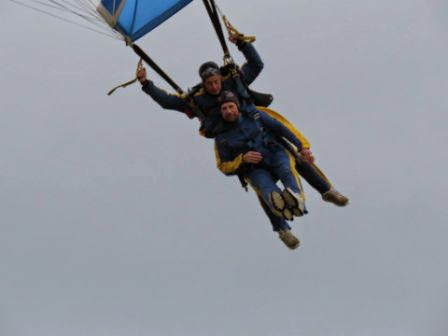 Oake and our Wilson following their parachute jumps! Rev. Wes stepped into the airport proudly displaying his Atlantic School of Skydiving t-shirt! There is a lot of activity and equipment at the site with tons of concrete and the support structure completed for the Airmen's Memorial. It is anticipated it will be moved from storage and placed in its permanent home within a week. We will have photos of the mounting of this huge memorial as it happens. The foreman and site workers we have hired, with the assistance of the Provincial Department of Advanced Education & Skills, are making great strides and in conjunction with Don Frost and Frosty's have the landscaping well in hand and our new trees, shrubs, etc. should be delivered shortly after the equipment is removed following the installation of the Airmen's Memorial. As well, the electrical and water connections are being completed and the grounds are being made ready for the plaza and walkway paving stones. To date 108 plaza stones have been purchased - only 792 left to go! Thanks everyone! Remember you can purchase a stone for $100.00 and have it noted as "In memory of..."
The sculptor, Morgan McDonald, advises that the life-size statues of Sgt. Gander and his handler are progressing well and are on schedule for completion by mid-September. Keep checking back for more updates and photos in the coming weeks. NOTE*** Donations in honour of Rev. 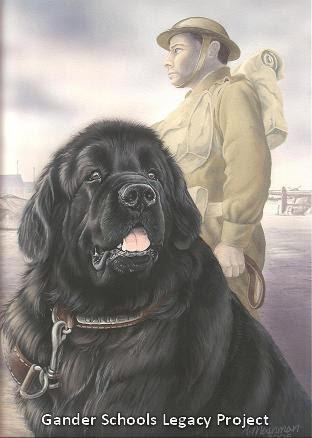 Oake may be made by cheque or money order to: Gander Heritage Memorial Park, c/o Joy Janes, 8 Bachman Place, Gander, NL A1V 1R8. Please indicate your donation is to sponsor Rev. Oake. If you make your donation through the website by Credit Card, please follow-up with an email message to Joy to indicate that you have done so at: rajanes@nf.sympatico.ca. This way we will ensure these donations are accredited to Rev. Oake.